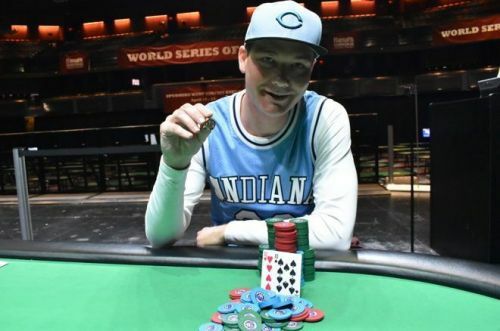 Back in 2014, Jake Bazeley won his first ever World Series of Poker Circuit main event title at the Harrah’s Cherokee, outlasting a field of 797 entries. Today, this poker pro from Cincinnati, Ohio managed to bag the same main event title for a 2nd time at the very same venue. Bazeley took down the 2018 WSOP Circuit Harrah’s Cherokee $1700 main event by overcoming a field of 1,127 entries, earning his second WSOPC gold ring and receiving the grand prize of $311,616. 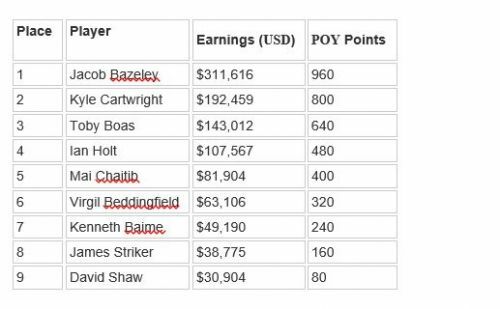 This win brought Bazeley’s lifetime live tournament earnings to a sum total of $4,385,362, making the current title his fifth largest score of his career which puts him fourth on Ohio’s all-time money list behind only David Peters, Byron Kaverman, and Keven Stammen. Jake Bazeley entered the final day of this tournament in 11th chip position with 15 players remaining. Kyle Cartwright, WSOP bracelet winner began the day as the chip leader. He eliminated Trey Walton, Allen Kessler and Nghia Le as he grew his stack even further. With that, he set the unofficial final table of ten, entering as the only player with over 100 big blinds in his stack. Kyle Cartwright sent David Shaw and Michael Kaczmarek to the rail to grow his stack even further. Seems like he wasn’t done with his elimination spree after all! Till this very moment, Jake Bazeley was amongst the shorter stacks. With a board of Queen of spades, 7 of diamonds and 5 of diamonds, Ian Holt moved all-in holding the 7 of hearts and 7 of clubs for the middle set. Bazeley called for less and revealed his queen of hearts and queen of diamonds for the top set. Bazeley found a key double up in a cooler situation as Holt didn’t hit this one out. Cartwright and Bazeley continued their takeover at the final table, eliminating James Striker and Kenneth Baime. Bazeley scored another knockout, picking up Ace of Clubs and King of Clubs against Virgil Beddingfield’s Ace of Spades and Jack of Diamonds and getting all-in preflop. His hand held up and Beddingfield was sent home in 6th place. “To just not lose your cool and just keep playing because everyone is getting stressed out in that moment, trying to get the pay jumps,” Bazeley said, speaking on the scenario. After being reduced to scraps, Mai Chaitib nearly clawed her way back from the dead, but went out in 5th place. Ian Holt was the next to go, dropping in 4th place. Shortly after, Bazeley knocked out Toby Boas in 3rd place with pocket kings coolering Boas’ pocket queens. Bazeley and Cartwright went head to head in the final game. Bazeley started out with a huge chip advantage but Cartwright doubled right away, gaining some chip to play with. The two giants of poker duked it out, Bazeley going for his second Circuit Main Event title and Cartwright going for an astounding fourth Circuit Main Event title. This left Bazeley and Cartwright heads up. Bazeley started with a huge chip advantage, but Cartwright doubled right away, gaining some chips to play with. The two giants of poker duked it out, Bazeley going for his second Circuit Main Event title and Cartwright going for an astounding fourth Circuit Main Event title. In other news, there were 13 gold ring events including Event #4 $400 NLH Six-Max, a tournament that drew 539 runners and Bazeley wasn’t the only one to win a ring at Harrah’s Cherokee. Daniel Statman declared himself to be victorious in Event #4 and three other cashes, including a runner-up finish in Event #11: $400 NLH Turbo BB Ante, gave him 100 points on the Casino Champion Leaderboard. Bazeley also secured a seat into the 2019 Global Championship. Meanwhile, Martin Ryan topped a 1,166 entry field in Event #8 $400 Monster Stack for a career high $70,226 and his 8th gold ring. Tom Gouveia, to win Event #1: $400 NLH Re-Entry for $104,807, and Blake Whittington, in Event #3: $600 NLH Big Blind Ante for $46,000 and his third gold ring. The WSOP Circuit Bicycle Casino has already awarded several rings and will hold its $1,700 Main Event this weekend.